A good ol’ fashioned ‘Battle of Alberta’ will take place over the next week and a half between the Edmonton Oil Kings and Calgary Hitmen. As part of their run to claiming the Central Division title, the Oil Kings enjoyed a 7-0-1-0 record against the Hitmen this season. Regular season statistics mattered little to the Hitmen though, who battled back to earn a series victory against the Lethbridge Hurricanes in a pivotal seventh game. Both teams are guided by offensive standouts with C’s on their chest. WHL Eastern Conference Player of the Year Trey Fix-Wolansky became just the second Oil King to record 100 or more points in a single season while Mark Kastelic’s 47 goals ranked third in the entire league. 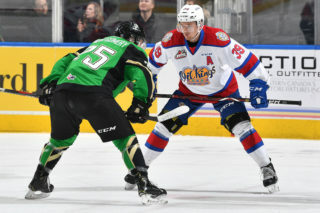 Depth scoring will be an essential part of this season as Oil Kings forward Vince Loschiavo and Quinn Benjafield will go toe-to-toe with the likes of Carson Focht and James Malm from the Hitmen. A pair of 2018 WHL Champions will face-off against each other as Calgary’s Kaden Elder battled Edmonton’s Andrew Fyten, both searching for championship glory in their final season of major junior hockey. On defence, the Hitmen have quietly put together a strong cast that includes the likes of Philadelphia Flyers prospect Egor Zamula, Nashville predators prospect Vladislav Yeryomenko and the 1999-born Dakota Krebs. The Oil Kings will counter with Conner McDonald and his franchise record 19 goals from the blue line while 2019 NHL Draft prospect Matthew Robertson will look to continue his strong 2018-19 campaign that has seen his stock rise. 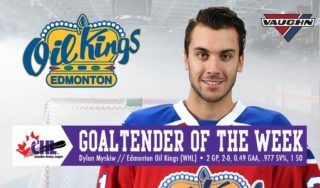 In net, the Oil Kings face a tough choice between Todd Scott and Dylan Myskiw, who were both strong against the Hitmen. Like they’ve done all season, the Hitmen will turn to unheralded rookie Jack McNaughton for success in the blue paint. Making his return to Edmonton will be former head coach Steve Hamilton, who was part of the team’s Memorial Cup run in 2014 as an assistant coach and then guided the team’s bench up until March 2018. We’re not superstitious, but we are a little stitious. In the previous two meetings in the WHL Playoffs, that winning team has subsequently advanced to the WHL Championship, only to lose in six games to their Western Conference opponent. However, fortune smiled on that team the following year as they won the WHL Championship. After Calgary beat Edmonton in the first round in 2009, they’d fall to Kelowna in the WHL Championship before winning it the next year. Following Edmonton’s victory against the Hitmen in 2013, they lost in six games to Portland before topping the Winterhawks a year later. All we can say is good luck to the winner. Game 1 of the series will be hosted by the Oil Kings at Rogers Place on Saturday, April 6 (7:00 p.m. MT). Game 3 of the series will see the two teams travel down the Queen Elizabeth Highway. 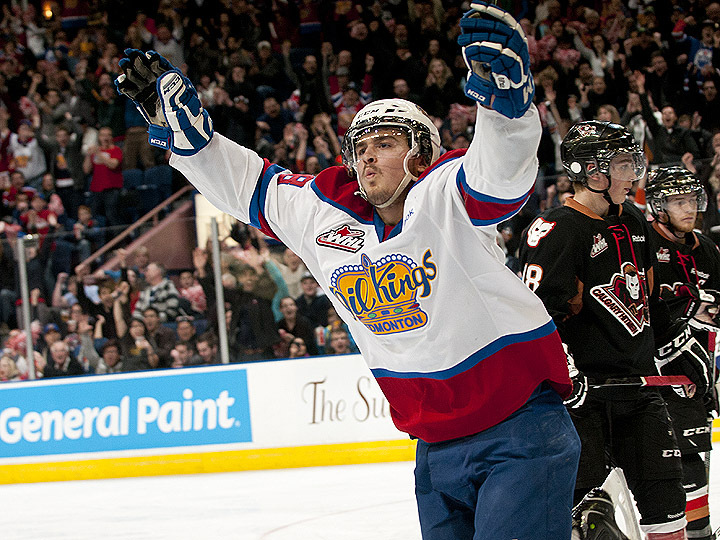 Catch every second of action between the Edmonton Oil Kings and Calgary Hitmen on WHL Live! Playoff packages available now at WHLLive.com! Fill the back of the net: The Edmonton Oil Kings can look as far as their season series and Game 6 for the Hitmen and the Lethbridge Hurricanes for how they need to approach this coming series. In the regular season, Edmonton tallied 35 goals in eight games against the Hitmen and didn’t let off the pedal when the offence was clicking. There’s no use saving your energy or goals for the Eastern Conference Championship if you don’t get there in the first place. Following each goal, the Oil Kings need to come back stronger and more determined to get the next one to continue the momentum in the contest. Having scored the fourth most and allowed the fourth fewest goals in the Eastern Conference this season, the Oil Kings have been strong on both sides of the puck. Keeping the confidence high on offence comes with treating each shift like they need another goal and not stopping until the final buzzer sounds. Defence: Throughout seven games, the Hitmen rose to the defensive challenge of taking down a roster laden with drafted or soon-to-be drafted NHL talent. They’ll face another big test against the Edmonton Oil Kings, who possess a deep talent pool on forward as well. Though the end result was a win, the path to that victory was more of a mixed bag of emotions as the Hurricanes looked to have solved the Hitmen in some defensive aspects while crumbling at others. For a defensive core that possesses just two 19-year-olds, making all of them eligible to return next season, the Hitmen have quietly built a balanced strong foundation on the blue line that continues to gain positive experience. Vince Loschiavo (37-25 – 62): After scoring the series-clinching goal in Game 6 on an odd-man rush with captain Trey Fix-Wolansky, there’s no ignoring the special season Vince Loschiavo has put together. A WHL career that began with the Kootenay ICE and continued with the Moose Jaw Warriors has found its greatest success in Alberta’s capital. Of his 37 regular season goals, which were tied with Fix-Wolansky for the team lead, six came against the Hitmen. Five of those came in the final three meetings of the regular season. With 95 goals in his WHL career, Loschiavo has been a reliable presence for offence, excelling this season with a career-high in goals and points. The recently-turned 21-year-old still has at minimum four more games in his WHL career with the potential for more, which is more than enough time for the Winnipeg, Man. product to make the goal light go off a few more times. Carson Focht (26-38 – 64): With just four goals through his first 24 games, Carson Focht had a first half most offensively-minded players would like to forget. When the Hitmen acquired the Regina, Sask. product as part of the Jake Bean trade last season, Focht was part of the big return the Hitmen received that was supposed to ignite the offence and their young core. On January 1, 2019 something changed though and Focht’s offensive potential began to shine through as he notched 19 goals in his next 28 games, including a four-goal game against the Swift Current Broncos and hat tricks against the Kootenay ICE and Medicine Hat Tigers. Focht continued to pick up steam in the first round with seven points (4G-3A) against the Hurricanes, including a pair of goals in the pivotal Game 7. Whatever change for the Hitmen forward has worked and he could easily be an offensive thorn in the side of the Oil Kings if he continues his play into the second round. Matthew Robertson (7-26 – 33): Matthew Robertson’s first taste of WHL Playoffs action saw him secure a respectable three points (1G-2A) in six games following career-high totals in the regular season. 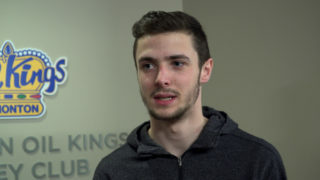 Ranked 18th among North American skaters ahead of the 2019 NHL Draft, the 18-year-old Robertson has developed into the player the Oil Kings hoped he would be when they picked him seventh overall at the 2016 WHL Bantam Draft. Robertson thrived against the Hitmen this season with six points (1G-5A) in eight games and the Oil Kings will gladly take any offensive contributions from the blue line after producing just three of their 19 goals in the first round. The heated rivalry that exists between the Oil Kings and Hitmen for bragging rights as the best in the province should bring out the best in the your rear guard, who can use the next week and a half to significantly raise his draft stock. Dakota Krebs (4-21 – 25): Along with the aforementioned Focht, defenceman Dakota Krebs was part of the return the Hitmen got in the Jake Bean trade and has also proved to be a key piece of the team’s success. Before this season he hadn’t surpassed the 25-point mark in any campaign since he played with the Rocky Mountain Raiders of the Alberta Major Bantam AAA Hockey League in 2013-14. So what’d Krebs do in his first full season with the Hitmen? He posted a career-high 25 points (4G-21A) in 61 games and was tied for the team lead with seven points (1G-6A) in the first round, recording five assists in the final three games combined. With a 6-foot-4, 205-pound frame, he’s also been tough to compete against in his own zone. As long as Krebs is excelling at both ends of the ice, it’s a case of ‘if it’s not broken, don’t fix it’ for head coach Steve Hamilton and company. He ranks in a tie for third in defensive scoring in the playoffs and should be able to rise to the occasion of helping thwart Edmonton’s offence. HTV: HTV: “We can look back on our whole season and see how we battled through adversity to get to where we are." Todd Scott (17 GP, 11-3-2-0, 2.79 GAA, .906 SV%, 1 SO): Late in a 5-0 loss to the Medicine Hat Tigers in Game 3 of their series, the Edmonton Oil Kings elected to swap goaltenders, going with 18-year-old Todd Scott. 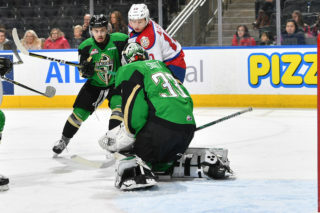 That moved paid off as Scott helped to lead them to the series victory with a 77 saves on 86 shots in 201 minutes of action as the Oil Kings won three-straight games to capture the series. Scott’s 2.69 goals-against-average and .895 save percentage weren’t among the league’s best, but they got the job done. This has presenting a conundrum for the Oil Kings. Against a Hitmen team they suffered just one loss against all season do they continue to ride the hot hand of Scott or go back to Myskiw? Scott was 1-0-1-0 in his two games against the Hitmen, posting a 2.45 GAA and a .912 SV%, though Myskiw’s six wins, 2.00 GAA, and a .935 SV% speak volumes about his success when directly matched up against the Hitmen. Scott’s second full season in the WHL saw him named the WHL Vaughn Goaltender of the Month for January so he’s risen to be among the league’s best before. Can he do it again? Jack McNaughton (46 GP, 25-14-3-1, 3.25 GAA, .888 SV%, 2 SO): Jack be nimble, Jack be quick, Jack lead the Hitmen into the second round without missing a tick. So it wasn’t quite smooth sailing for the rookie goaltender and the Hitmen in their first-round series, but they got the job done. They were headed home facing a 2-0 hole against the dominant Hurricanes and without their captain and offensive leader. Instead of folding, the Hitmen rallied for four wins in their next five games with the cherry-topping win in Game 7 in Lethbridge. Through the good and the bad, McNaughton was there for the Hitmen. Now, they’ll need him to be on his game to push them a little further. In three of his six starts against the Oil Kings this season, McNaughton allowed three goals while Edmonton found a way to pour in the offence in the other three. Ultimately, the Hitmen’s defence as a whole — not just their blue line or their goaltender — will bear the responsibility of earning the series victory. If McNaughton can play at the high level he’s shown throughout the season, a series win may just be realistic for the Cowtown bunch. HTV: “Definitely your ego grows a bit when you make those saves but you can’t let it get to your head." 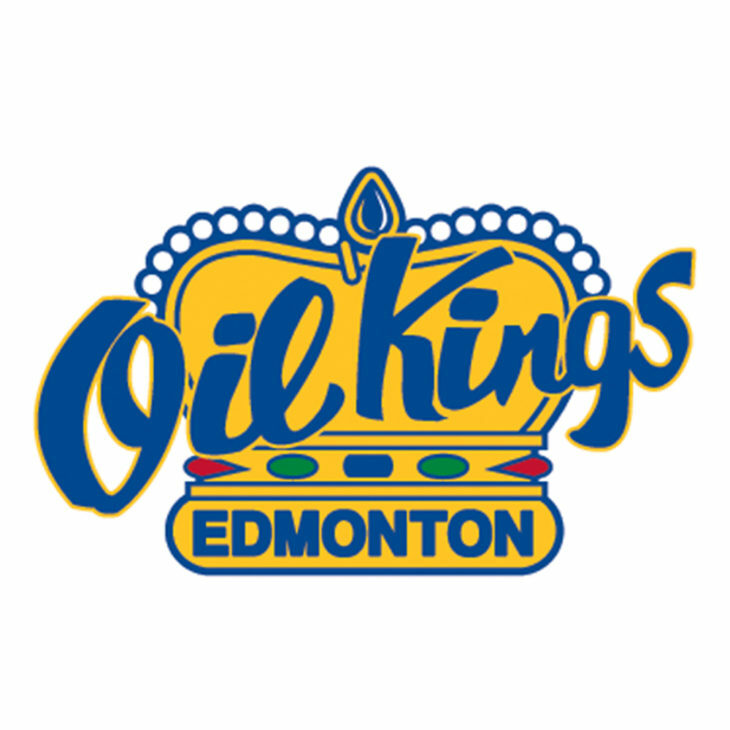 In 2013, the Edmonton Oil Kings turned the tables on their rivals with a seven-game series victory. Laurent Brossoit protected the crease for the Oil Kings while the likes of Michael St. Croix, Henrik Samuelsson, Griffin Reinhart, and Curtis Lazar among others provided offensive contributions. The Hitmen swopped into Rexall Place to win Game 1 of the Eastern Conference Championship. However, the Oil Kings’ offence would come alive in Game 2 to the tune of a 6-0 win that featured a 23-save shutout from Brossoit. The Oil Kings goaltender would go on to post a 26-saves shutout in the deciding Game 7 while Michael St. Croix scored both goals. After experiencing a downturn in recent years, what can the present-day Oil Kings do to replicate the magic felt during their team’s runs to the WHL Championship Series? Will this series against the Hitmen play out like it did in 2009 or 2013? If we’re going to be talking about shutouts in the WHL Playoffs, a 21-save shutout from Martin Jones, a pair of goals and three points from Joel Broda and three goals in the second period is what awaited the Edmonton Oil Kings when they first took to the ice in WHL Playoffs action against the Calgary Hitmen back in 2009. 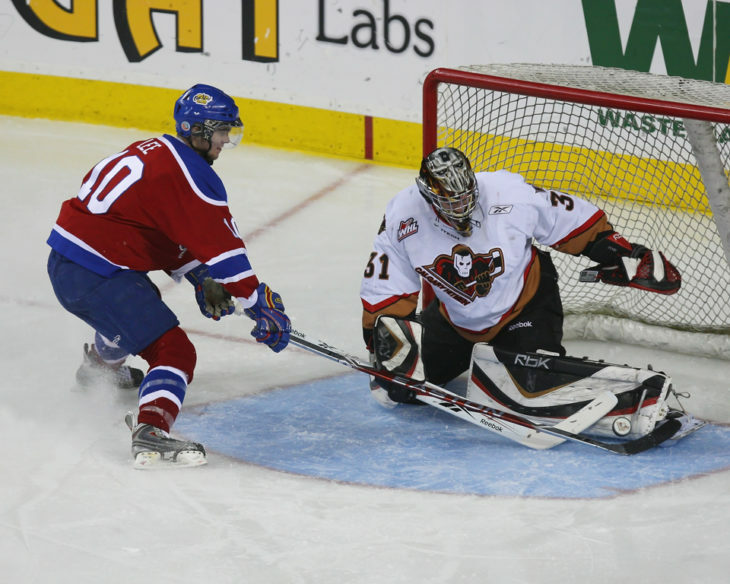 In the four-game first-round sweep, the Hitmen outscored the Oil Kings 15-3. 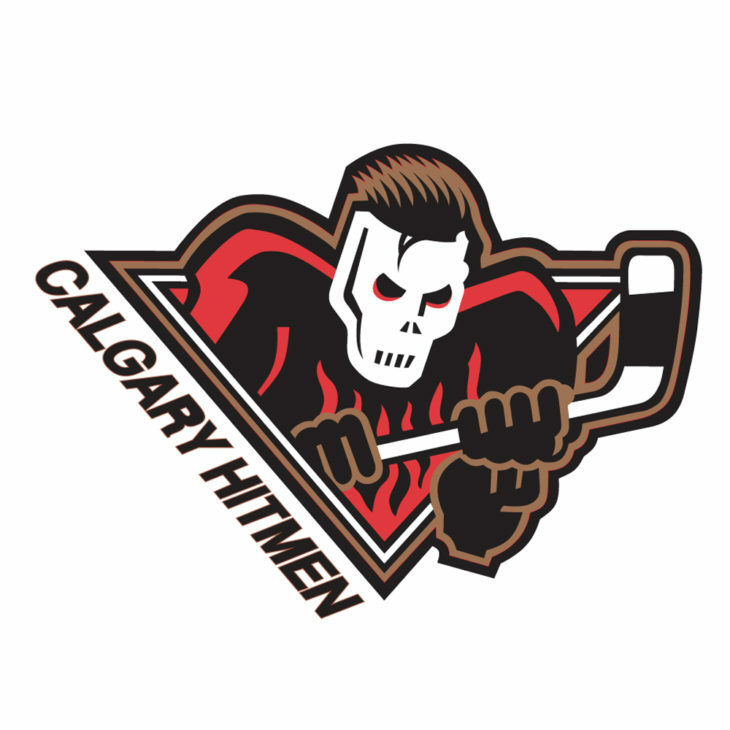 Back then, the Hitmen were hitting their arc, making their first of two consecutive appearances in the WHL Championship Series, losing in 2009, but winning the next year. 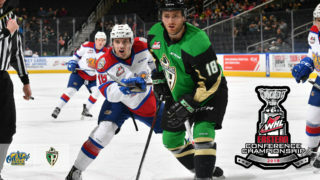 The Oil Kings would gain a measure of revenge four seasons later in the Eastern Conference Championship, but despite being separated by just a few hundred kilometres, they haven’t met since. The Battle of Alberta has brought out the best of both teams though and the top-seeded Oil Kings know to expect the best from the Hitmen who enter as the perceived underdogs. With the all-time playoff meetings tied at a simple 1-1, are the Hitmen destined for a win in the rubber match? Will this be the series that helps to invoke memories of previous championship squads? 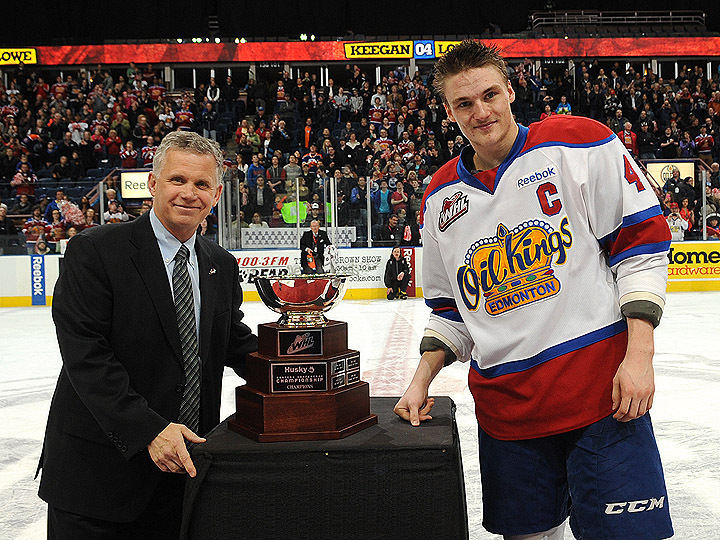 WHL Commissioner Ron Robison presents Edmonton Oil Kings captain Keegan Lowe with the Eastern Conference Championship trophy in the 2013 WHL Playoffs. 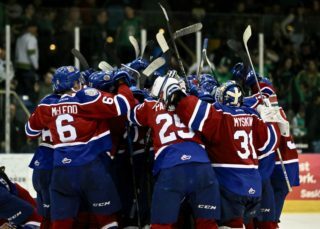 Photo: Edmonton Oil Kings.